We make them regularly. Almost daily. And I try to pack as much nutrition into them as I can. 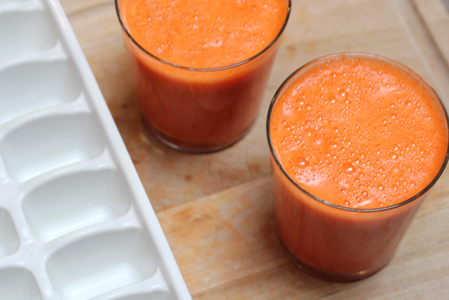 Fresh banana, frozen berries, frozen apple slices, and now carrot juice cubes! 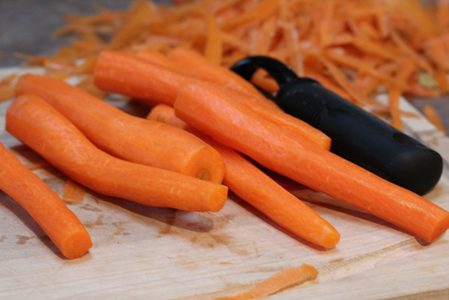 A few weeks back, carrots were on sale 2 lbs/$.99…a great price! So I grabbed 2 bags…then found myself wondering what to do with 4 lbs of carrots! I thought about chopping them up and freezing them for soups. But soup season is just about over in my book. Lop off the tops and bottoms. Peel. Involve the kids. And hold the baby, who might be afraid of the noise of the juicer. (This is the Krups Juicer. A wedding gift, that we still use…mostly in the summer months…and love almost 9 years later! It was one of the few small appliances that we took with us to the Dominican Republic after we got married.) Although, I’ve recently switched to the Hamilton Beach Big Mouth Pro Juice Extractor as there’s less chopping to be done. About 3 lbs of carrots made 2 full cups, probably 3 – 3 1/2 cups. I did not measure it. And I kept the last pound or so of carrots in the fridge to use when cooking. 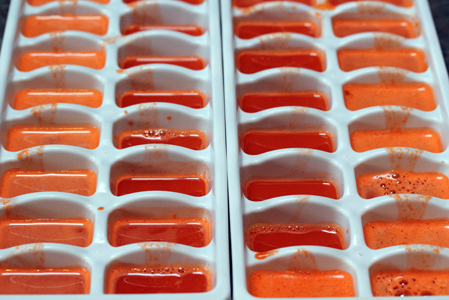 Freeze completely and then break the cubes out and store them in a plastic freezer bag. Use 2-3 cubes in your smoothies. I love the carrot juice brings a ton of nutrition without dramatically affecting the taste. If anything, the carrot juice adds a little sweetness to the smoothie! 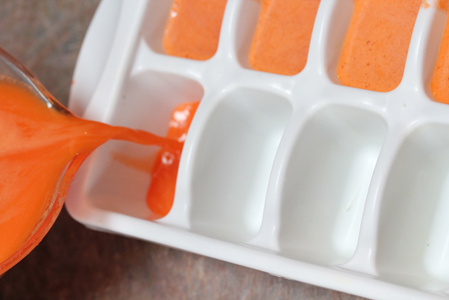 Next time you find yourself with more carrots that you know what to do with, now you know! I am now planning EXTRA rows of carrots in my garden! Thanks! We also have a juicer that was given to us. Thanks for this idea 🙂 I was wondering if you do anything with the left over pulp? Is it just useless after you squeeze all the juice out? I use carrot pulp in my stocks or feed it to the rabbits to get fertilizer. That’s a great idea. 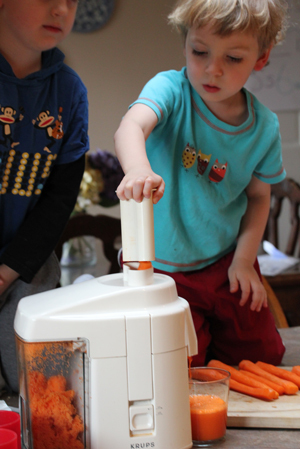 We don’t have a juicer, but I bet it would work with cooked carrots. I can’t imagine having a hard time using up 4 pounds of carrots, though! 🙂 Those are one of my staple veggies, just because they are so cheap! I love adding carrots to my smoothies! We don’t have a juicer but after reading this I might have to go buy one. The wife, girls, and I all love the healthiness of smoothies. We really need to make more smoothies and with summer coming is a great time to do so. This is a nice concept. I don’t have a juicer either so will have to see if I can find one for a good price as I have always wanted one so reading this post is sure motivating me to buy one! We love smoothies here also….yum. I just read a recipe for muffins today using the pulp from a juicer. Think it was in a book I checked out of the library. I don’t have a juicer so I didn’t pay too much attention – but this is the second juicing thing I’ve read today. Now I’m starting to want one. Great idea, I would use some for baby food, Pressure cook and then puree!! I also add the puree to meatloaf, mac and cheese, quick breads and smoothies!! I love sneaking in good food everywhere I can. I love steaming carrots, they are soft and sweet. sometimes its better than candy! I never thought of juicing mine for smoothies. That would be good. I get 5 lbs of carrots from Sam’s Club for .39/lb (that’s their regular price) and we go through them quite often. I know Vons sells huge (i.e. 20 or so pound bags) of carrots just for juicing; I am not certain of their price per pound. 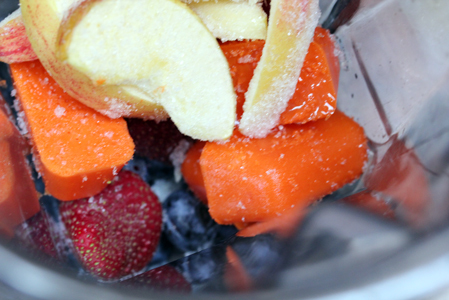 I was just thinking….instead of juicing the carrots..couldn’t you just grate them and freeze them for smoothies? This way you could get the best of both worlds…the fiber and the juice. My smoothies contain the whole fruit and or veggie in them anyway and I have a whole bunch of carrots I need to do something with. Thanks for getting my creative juices flowing. Good information about freezing carrot juice for smoothies, I love my carrot juice mixed with gala apples to sweeten up the taste a bit. Thanks for the information. I juice carrots ALL the time. Love them! I never peel mine, and it turns out great (and in less time). 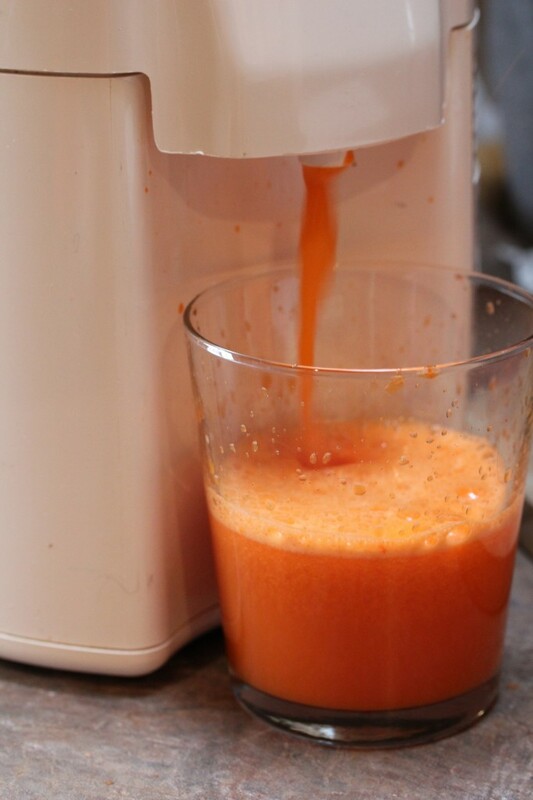 My favorite combination is 1 Granny Smith Apple, 1/2 peeled lemon, and enough carrots to make 12 oz of juice. Yum! I bet you could use the carrot pulp in Morning glory muffins instead of shredded carrots! Yum!